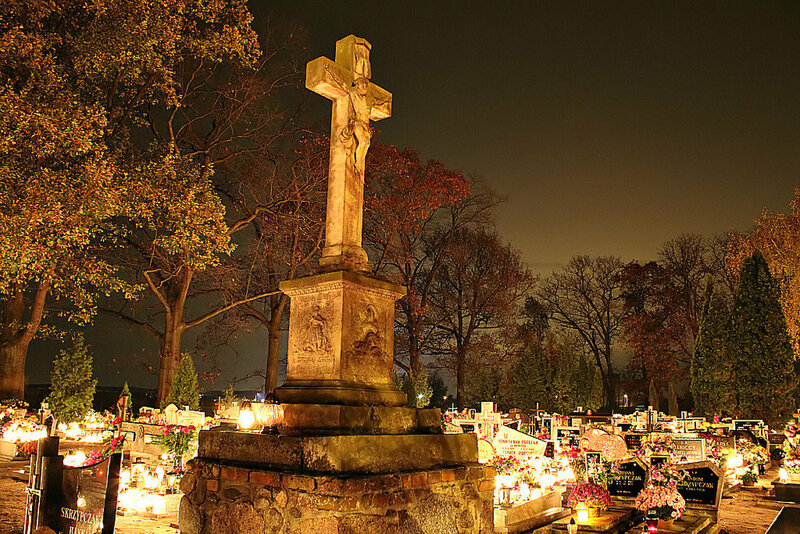 November has arrived and with it our commitment and duty as Christians to pray for the dead. During this All Souls Month of November we especially recall the poor souls in purgatory. The Church teaches us that after death there is for some as state of purgation, more commonly called Purgatory. It is entirely different from Hell. It is simply a purifying process for those who die in God’s grace but are not yet prepared to enjoy the glory of heaven. It is good theology, and it is good common sense. Imagine if we got a call when we got home and they told us that the President or the Pope was coming for dinner. Wouldn’t we want some time to prepare? Wouldn’t we want to get ready to greet them? And so it is when we are called at death to the eternal banquet by God our loving Father. Jesus tells us in the Gospel of John: “I go to prepare a place for you.” So we too prepare to meet our Lord, by our time in purgatory. We pray for the dead and have Mass offered for the repose of their souls because the dead who are in as they depend upon the aid and charity of our prayers. For that reason, we have the custom of calling them poor souls. We are urged to always remember the dead daily in our prayers and at Masses. These beloved souls undergoing purification after death depend completely upon the charitable remembrances of us who are their fellow members in the Mystical Body of Christ, the Church. At the same time, they continue to love us and can also pray for us. Today in very special way we remember our fellow OLM parishioners who died over the last year. We remember them and all souls during this month. Eternal rest grant unto them, O Lord. And may perpetual light shine upon them. May they rest in peace. This Sunday night at the 5:00pm Mass, we celebrate with great joy as a parish with the 88 young adults who are to receive the Sacrament of Confirmation and begin a new chapter in their young lives as Catholic disciples. They receive the gifts of the Holy Spirit and the grace of God to help them live as courageous witnesses of Christ in the world. We are grateful that they have chosen to come forward for the Sacrament and continue to grow in their Catholic Faith. We thank their parents and sponsors who have led them to this important occasion in their faith life. We also thank the many teachers who taught them the ways of Christ and the rich teaching of the Catholic Church. We must also thank Bishop James F. Checchio of Metuchen, NJ for traveling to OLM to celebrate Confirmation with our young adults. It is a great privilege to have him with us for this special occasion in the life of our parish. Bishop Checchio’s episcopal motto is “Be reconciled to God.” This motto recalls St. Paul’s appeal for us to continue the central mission for which Jesus was sent by the Father. And so let us pray for our newly Confirmed that they may always be reconciled to God in their lives. May they continue to grow in faith, hope and love as go forth sealed with the Holy Spirit and confirmed in their Catholic Faith. We offer a warm welcome to Bishop Checchio and our prayerful congratulations to our Confirmandi! Do good. Be well. God Bless! Happy Veterans’ Day!